In an age of constitutional revolutions and reforms, theory and practice are moving in opposite directions. As a matter of constitutional practice, human dignity has emerged in jurisdictions around the world as the organizing idea of a groundbreaking paradigm. By reconfiguring constitutional norms, institutional structures and legal doctrines, this paradigm transforms human dignity from a mere moral claim into a legal norm that persons have standing to vindicate. As a matter of constitutional theory, however, human dignity remains an enigmatic idea. Some explicate its meaning in abstraction from constitutional practice, while others confine themselves to less exalted ideas. The result is a chasm that separates constitutional practice from a theory capable of justifying its innovations and guiding its operation. 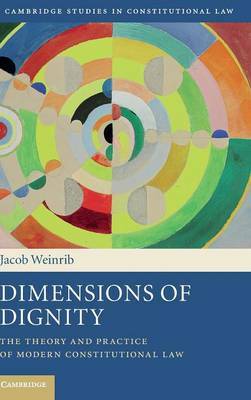 By expounding the connection between human dignity and the constitutional practices that justify themselves in its light, Jacob Weinrib brings the theory and practice of constitutional law back together.